What’s your favorite Malbec? Got any great values for us to try? C’mon! Let us know! We’re almost finished with Bordeaux varieties! We’ll move on in a couple of weeks. I know what you’re thinking: “Isn’t Malbec from Argentina?” You’d certainly think so, these days, because Argentina grows more Malbec than anywhere else in the world. But, it probably came over from southwestern France in the mid 19th century. We don’t know how far back it goes in France, but it’s been known in southwestern France, including Bordeaux, since at least the 18th century. We call it a Bordeaux variety because it’s been a traditional part of their red blends for a few hundred years. As it explodes in Argentina, it’s gradually disappearing in Bordeaux, mainly because of it’s tendency to “shatter” – not pollinate well – there. Here in Napa Valley, it’s still considered a player in putting together a Meritage or Bordeaux-style blend. TRIVIA! In Cahors this grape has multiple names: Auxerrois, Cot and – Malbec. It’s so popular, you tell me! You sure get a good bang for you buck, don’t you? It’s a very flavorful grape. The “black” reference is appropriate because it’s thick-skinned, with tons of pigment and a healthy dose of tannin too. Question from Lindsay: Everytime I go to the store to buy wine for a gift or a party, I’m overwhelmed by the choices. I know there are Merlots, Shiraz, Cabernet Sauvignon, Pinot Noir, and a few other types, but I have absolutely no idea what the difference between all of them are. To me, they are all red. Can you give a brief overview of the general differences. Characteristics vary, a little or a lot, depending upon where the wine is grown and how it was made. Weight: Full bodied – big – substantial. And deeply colored. If you’re not sure what I mean by weight, you might compare it to the way milk feels on your palate: Light bodied = skim milk; Medium bodied = whole milk; Full-bodied = cream. Flavor profile: Black fruit such as blackberry, black cherry, black currant; it may show earth, cedar, bell pepper, green olive or any number of other descriptors, depending, again, on where it’s grown and how the wine is made. When the winemaker chooses new barrels for aging the wood may add vanilla, spice, smoke, grilled bread, mocha, nutty character or a sense of toastiness. Pucker factor (Tannin): Very noticeable. Tannin runs around your mouth seeking out protein and then clings to it. That’s what accounts for the drying, gripping sensation. Cab has thick skins and the skins are the source of the color and most of the tannin. If you sometimes think you’re drinking Merlot and it turns out to be a Cab – or vice versa – there’s a good reason. These grapes are similar. Take Cabernet back a notch and it begins to look more like Merlot. Flavor profile: Merlot often shows red fruit intermingled with black: Currant, black cherry, plum, violet, herb-like, earthy; Oak will add some of the woody characteristics described for the Cab. Question from Bob: Hi! I'm confused. I thought Malbec is from Argentina but you said it's a Bordeaux variety. What's the story? Hi, Bob! Thanks for writing. When you look at the shelves of your local wine shop, it's completely understandable that you'd think Malbec is from Argentina, but it was imported to Argentina from France in the mid 1800s. And, then, it' wasn't until the mid 1990s that it really took off as the "it" wine from Argentina. Its origins are uncertain, but we know it's been in Southwest France since at least the 1700s and was the most widely-planted variety there until the 1950s. If you've ever had a bottle of the rustic Cahors (where it's called Cot) from southern France, it's at least 70% Malbec. There's also a small amount grown in the Loire Valley, where it's called Cot or Auxerrois. In Bordeaux it was used to give the wine weight and color, but the plantings have greatly declined over the past several decades mainly because it's difficult to get it ripe in that relatively cool climate. 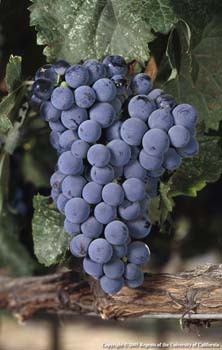 Virtually all wine grapes, worldwide, are of European origin and are members of the species Vitus Vinifera. And, Vinifera came to Europe via Georgia and Armenia. Wine is also made of native American varieties, but it has a tiny market niche. We seems to prefer these old-fashioned varieties that have been used for centuries. But, no one would argue with you that when it comes to Malbec, Argentina is the immediate association. In fact, any number of producers in Cahors are known to be copying the "new world" style of Argentinean Malbec and ramping up marketing trying to get a piece of the Malbec action!